Clodagh graduated from the Gaiety School of Acting Full Time Course in 2013. Upon graduating she co-founded The Cup Theatre Company, for whom she is now Artistic Director. Most recently, their company produced STELLA FULL OF STORMS, a one woman play, in which she played the title role. STELLA FULL OF STORMS won Best New Play and was nominated for Best Female Performance in the IGD Theatre Festival. Other theatre credits include TRYST ( Lir, Tiger Dublin Fringe), Second Age’s HAMLET (Helix), CIRQUE DE REVES ( Smock Alley), WRONG TURN AT LUNGFISH ( Civic and Viking), THE WISE WOUND (Smock Alley), JOANNA (New Theatre), ROMEO AND JULIET ( Smock alley and Granary Theatre) FEWEER EMERGENCIES ( Granary Theatre). 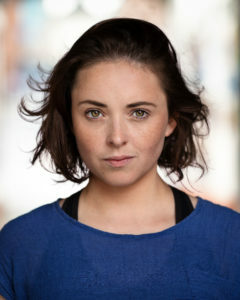 Her film credits in CUMANN NA BMAN(TG4), which won an IFTA in the Specialist Factual Category, and the virtual reality film version of JOANNA.